A unique blend of pure fish oil protected by powerful antioxidants. Omega 3 fatty acids are very fragile and when they break down they are less effective. 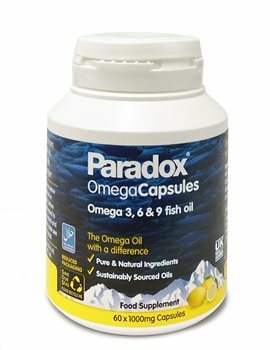 Paradox brings together the best from the Mediterranean and Arctic diets to create a unique blend scientifically proven to be more stable for longer. May Maintain Heart, Joints, Brain, Skin, Bones, Eyes. High in EPA & DHA. Omega's 3, 6 & 9. Omega 3 - 540mg, EPA - 225mg, DHA - 225mg, Omega 6 - 65mg, Omega 9 - 450mg. Pure deep sea fish oil, pure extra virgin olive oil, pure organic lemon oil, fish gelatin (capsule). 12 Years - 2 capsules. Expectant Mothers - 2 capsules. Paradox Omega oil, if taken in conjunction with a balanced diet may help maintain the health and function of the major body systems. Do not exceed recommended daily dose. Keep out of the reach of young children. Pregnant women should consult their doctors before taking any mineral or vitamin supplements. (recommended by my GP) and found it to be effective. I do not like the huge capsules size (of other brands). This one is just the right size for me. Competitive priced. Prompt international shipping. (Received it within a few days of my order.) Excellent shipping rates too. Glad I found your site. Having damaged my ankle nearly 3 years ago and now suffering from arthritis making it sometimes difficult to walk I saw this item advertised and thought I would try anything to be able to have more comfort! Been taking them for nearly a month and what a difference they have made, easier to walk, move and virtually no pain, amazing!! I bought these capsules for the first time 3 months ago and within 4 weeks I am now virtually free from the eczema I have suffered for the last 15 years. I now feel able to lead a normal life. I will continue to take them continuously from now on and would recommend them whole heartedly. Would not like to be without Paradox capsules now having tried them for 5 months but would like to buy in larger sized bottles i.e. 6 months or l years not in boxes of just one month - hopefully reducing cost of same. Could not fault your company for supplying orders so quickly - excellent.